Kidlet: In Nineteen Hundred Ninety-Two Columbus sailed the ocean blue! Me: So Columbus discovered America when Mama was 9 years old? Kidlet: Wow. You're older than I thought. 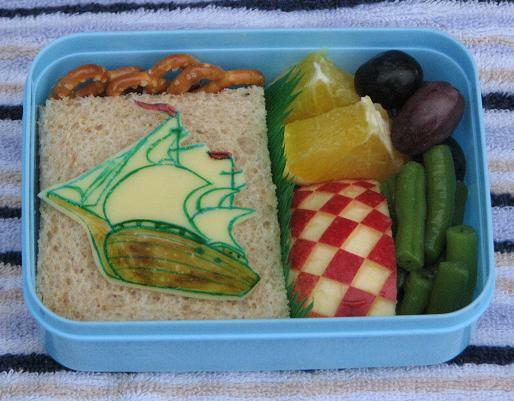 Today is the Mayflower of cheese and food color marker on top of a peanut butter and jelly sandwich. Along for the ride are pretzels, checkered apple, green beans, orange slices, and grapes! Agree with javapot, very nice cheese-boat!